194 pages | 5 B/W Illus. This book aims to make sense of the recent reform of neighbourhood institutions in urban China. It builds on the observation that the late 1990s saw a comeback of the state in urban China after the increased economization of life in the 1980s had initially forced it to withdraw. Based on several months of fieldwork in locations ranging from poor and dilapidated neighbourhoods in Shenyang City to middle class gated communities in Shenzhen, the authors analyze recent attempts by the central government to enhance stability in China’s increasingly volatile cities. In particular, they argue that the central government has begun to restructure urban neighbourhoods, and has encouraged residents to govern themselves by means of democratic procedures. 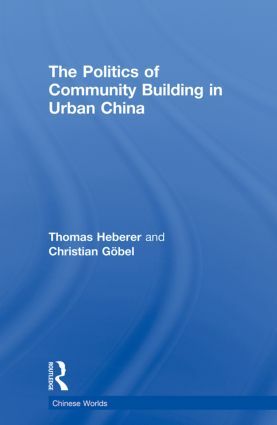 Heberer and Göbel also contend that whilst on the one hand, the central government has managed to bring the Party-state back into urban society, especially by tapping into a range of social groups that depend on it, it has not, however, managed to establish a broad base for participation. In testing this hypothesis, the book examines the rationales, strategies and impacts of this comeback by systematically analyzing how the reorganization of neighbourhood committees was actually conducted and find that opportunities for participation were far more limited than initially promised. The book will be of interest to students and scholars of Chinese Studies, Development Studies, Urban Studies and Asian Studies in general. 'The Politics of Community Building provides a perceptive and intellectually lively guide to this evolving locus of urban governance.' - Benjamin L. Read, University of California, Santa Cruz; The China Journal (July 2013).